whats youre favorite compressor plugin ? Re: whats youre favorite compressor plugin ? Kind of a broad question but I'll throw a few out there... I'll usually grab BF1176 for a vocal or if I want to smash something up like a drum room or whatever. I also like the LA2A and Fairchild 660, which I use a lot without even compressing as it will fatten/warm things up just by being there. If there's a difficult to tame problem(or sometimes on the master bus) I'll use Waves C4 but it's quite a cpu hog! McDSP MC4000 gets used in a similar way if I'm concerned about cpu. Here's one that's maybe not so obvious... McDSP AC1. I'll use the console emulation quite a bit but it also works well as a subtle-ish bus comp for parallel type stuff and it's my current go to for Parallel drums and instruments. Also their AC2 (tape emulation) gets used a LOT and functions as subtle compression/fattening. I REALLY like the Sony compressor but I don't currently have a working copy '(. T-Racks tube comp and limiter emulations can be pretty juicy too! I use Metric Halo Analog Channel quite a lot (mostly for eq) but I'll usually try the comp as long as it's on there but it's hit or miss for me. 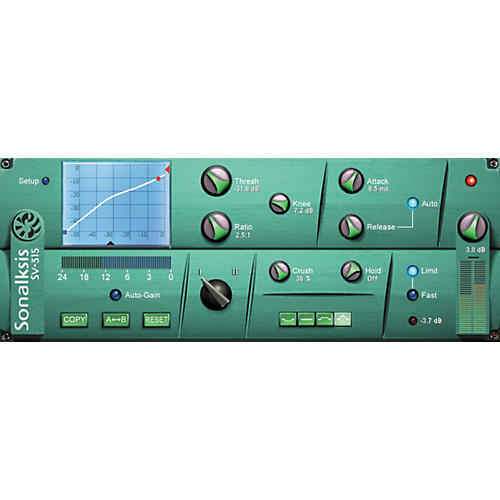 dynamics is a field where i mostly code my own plug-ins, but otherwise, and since i am not a PT guy, the nomad factory bluetubes and the sonalksis comp would be my favorites, because they color the sound a bit and i like their look. Ohh yes ! Please Upload 110 !!! BF 1176 is one of my fav's too . You can hear , whats going on. the "pro version" currently requires jitter but i will rebuild it for you. that was on my to do list anway. Tricky. No Jimmie. Nor Benny. Yes the Drawmer GCL is a very important plug for me too!! The T Racks make a lot punch . Not sure yet , but first impression isnt bad. It has a great sound, and it's the easiest to use, by far. The bouncing ball alongside the compressor curve, shows you what the compressor is doing in each moment. cool ! but they dont have a PT mix TDM mac os 9 version ?